urhood and want yours to be better? 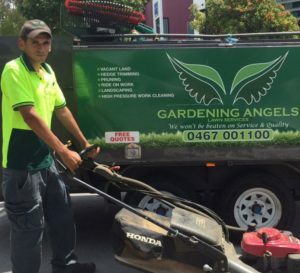 Well, if you after transforming your garden for the better with top quality lawn mowing, hedge trimming, and high-pressure cleaning, then Gardening Angel is the team for you. With years of experience helping the residents of Derrimut, we know what it takes to provide our clients with the pristine service they deserve. Our services can be adjusted to suit your requests and your requirements so that you will end up with the garden that you want. For more information about how we can change your home for the better, speak to us directly on 0467 001 100 or fill out our online form, and we will get back to you as soon as possible. Looking at your lawn and want something more? Our lawn mowing service can make all the difference for your Derrimut home. We have all the experience needed to cut your lawn to your exact measurements and give it the perfect blend of colour and shine. We pride ourselves on delivering a lawn mowing service that makes us stand out from the crowd. Cleaning the outside of your home, your patio and your garden can be a tiresome task. Why not let a professional that prides themselves on the best result do it for you? That is what we can we do for you with our high-pressure cleaning service. In our van, we have the latest, most advanced high-pressure cleaning equipment; giving us the platform to clean every corner and crack in your home. There is no question that if you are looking to provide the outdoors of your home the best clean, we are the gardeners to do it for you. With the right cut, you can have your landscape looking amazing from every angle, regardless of the design and style you want. Thanks to our in-depth gardening hedge trimming service, we can make your garden look out of this world. With our steady hands, laser-eyes and wild imaginations, we will be able to cut and trim your garden to your exact designs. There are no limitations to what we can achieve for you. We can do all this at a great rate and with a giant smile. Don’t settle for your dull garden when you can have something that is out of this world. If you want more information about our gardening hedge trimming service, speak to us directly. At Gardening Angels we strive to provide a quick and efficient service all over Melbourne, we also do landscaping services in Williamstown north, get in touch today!